Raise the Red Lantern (Dà Hóng Dēnglóng Gāogāo Guà, 1991) was director Zhang Yimou’s fourth feature film, coming right after his outstandin g breakthrough feature, Ju Dou (1990) and again starring Gong Li. The story of the film, which depicts the travails of a concubine who has just joined the household of a rich family in northern China during the 1920s, is based on the 1990 novel Wives and Concubines by Su Tong. Naturally, much of the critical comment about the film has concerned the status of women in traditional Chinese society and the degree to which the circumstances shown in the film reflect larger social and political issues. But what makes the film peculiarly attractive, almost hypnotically so, seems to lie elsewhere – not on the social plane, but on another, deeper, level. This additional dimension arises from Zhang Yimou’s uniquely expressionistic visual style, which of course emphasizes color, but actually makes use of all aspects of the cinematic medium. 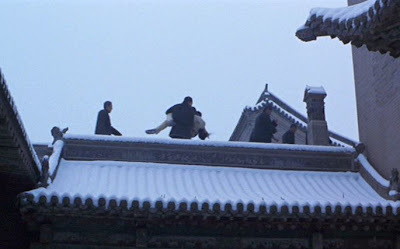 In this connection the filmmaker I would most closely compare to Zhang Yimou is Michelangelo Antonioni. Both Zhang and Antonioni emphasize the emotive influence that the physical (i.e. visually observable) environment has on the characters and the story, and they are both known first to choose the physical settings for their films and then build their stories around them. Although Antonioni characteristically employed more camera movement than Zhang does to accentuate this effect, they both achieve an existential mood that permeates the events on display. As a result, although the films of both of them may touch on the social sphere somewhat, they ultimately reach a more profound level that suggests the universal struggles of the individual soul in a heartless and uncaring cosmos. There is a further key aspect associated with Zhang Yimou’s style of this period, almost an essential aspect of it, that must be mentioned – the magnetic per formances of his lead actress, Gong Li. I will discuss her connection with Zhang Yimou’s style, and the degree to which her presence is crucial, further on in this review. 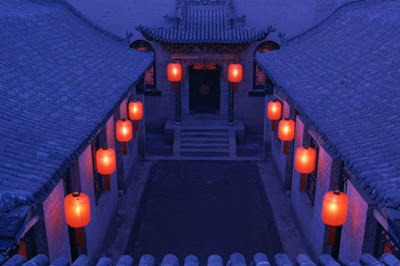 In the matter of Zhang’s cinematic style, Raise the Red Lantern is particularly interesting, because its purely visual stylistic virtues manage to overcome its weaknesses in other areas. 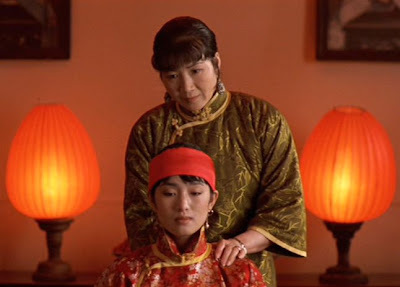 At the beginning of the story, the father of 19-year-old Songlian (Gong Li) has just died, and the loss of his income has left the family in such financial straits that her stepmother insists that she drop out of college and accept an arranged marriage. Presumably it must have been a considerable achievement for a woman from a non-wealthy family to have been studying at a college, and Songlian is obviously disconsolate at being forced to abandon everything for an arranged marriage. Expressing passive resignation to her materialistic stepmother’s wishes, she says a rich man might as well be selected. When she is warned that a wealthy husband would come at the price of her being only a concubine, she sighs, “isn’t that a woman’s fate?” And so her fate is sealed, and she is married into the wealthy Chen family. Meishan, the pretty third mistress, is a former Peking opera singer and jealous of just having been supplanted as the master’s favorite. She is a spoiled, self-centered schemer who engages in all sorts of stratagems to both annoy Songlian and lure the master back to spending the nights with her. Yan’er, Songlian’s teenage servant, is also jealous of the new fourth mistress. Master Chen had earlier had sexual relations with her, and consequently she had hopeful delusions of being named the fourth mistress, herself. Now she proceeds to take out her resentment on the new fourth mistress. When she is not off in her dreamworld imagining the red lanterns being raised just for her own fanciful nights with the master, she acts spitefully and hurtfully towards Songlian in every way that she can. Zhuoyun, the second mistress, is warm and unassuming. She offers her friendship to Songlian and expresses her sympathies in connection with the scheming Meishan. But when Meishan later makes a peace with Songlian, she warns Songlian that Zhuoyun is deceptive and frankly even worse than she, herself, is: “she has a Buddha’s face, but a scorpion’s heart.” And indeed Songlian comes to discover the painful truth in Meishan’s warning. Yuru, the first wife, is much older and has a grown-up son. Although she has some ritual authority, she has long since been forgotten by the master, and it has been a long time since the red lanterns have been raised for her. In this artificial and cloistered world Songlian finds herself playing the only game available: competing for the master’s selection. There is no love on the part of any of the parties, only the gratification that comes from winning the game. And there’s more to it than just winning that master’s attentions. It becomes clear to Songlian quickly enough that the servants only show real respect to the master’s current favorite mistress, the one for whom the red lanterns are being raised every night. The lower-ranking mistresses are essentially ignored. as a consequence In this microcosm, Master Chen is not only the law, but also the source of all values. Everything revolves around his whims. Songlian even hears that if a mistress ever proves to be unfaithful to the master, she is secretly hanged in a garret on the roof. And that horrifying prospect turns out to be more than just a rumor, as later events transpire to demonstrate. Despite the master’s central importance to the governance and operation of the Chen household, though, he is rarely seen in the film, and when he appears, it is only in the background or in the distance. But the shadow he casts is perhaps more forceful than the real figure’s presence. Zhang Yimou’s claustrophobic visual focus is entirely on the machinations involving the women: the mistresses and the servants, and how they behave towards each other. As the story progresses and the fourth-mistress Songlian struggles to hold her ground with respect to the other mistresses, she becomes increasingly frustrated – not only with how she is treated, but with the pointlessness of the whole enterprise. Her only options, it seems, are to serve as nothing more than either a utilized or a discarded garment for the master. Eventually the inevitable tragedies ensue. Songlian turns out to be unwittingly the cause of successive catastrophes which shatter others and ultimately take the ultimate toll on her own mind. She ends not only totally without hope, but deranged, as well. Overall, the narrative of Raise the Red Lantern presents a relentlessly grim destruction of the human soul. From a cinematic and narrative perspective, the focalization is almost entirely with Songlian, but not exclusively so. Many of the shot perspectives are not strictly from the point of view of Songlia, but from the point of view of an some unseen, nosey viewer who is a privileged witness to her destruction. But in spite of the continuing grim picture presented in the film, it is nevertheless also continuously fascinating, as the viewer follows the superficially courteous, but insidious, ways in which the various women treat each other. In this respect it’s interesting to compare and contrast the attention to the women's circle in this film with Antonioni’s similarly women-focused story, Le Amiche. Both films concern a circle of upperclass women and the ways they use and abuse each other in seemingly civilized fashion. 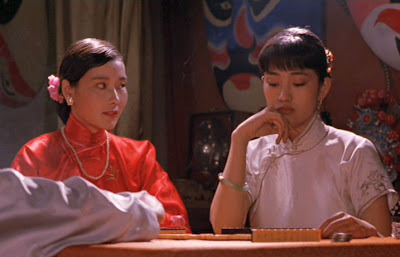 But the women are cast in vastly different circumstances -- Antonioni’s women in Le Amiche are situated in greatly different circumstances than are Zhang Yimou’s in Raise the Red Lantern. For instance Le A miche is set in postwar Italy, where new opportunities were appearing, and the women were almost reveling in, and at the same time struggling to come to terms with, the new freedoms available to them. In Raise the Red Lantern, on the other hand, the lives of the women are completely circumscribed by oppressive, time-worn rules and Confucian traditions. Instead of exploring new freedoms, these women are struggling to find space for even the smallest bits of autonomy that is available to them. In this context (of women and their relationships) we come back to the subject of Gong Li and the significant role she plays in all this. To me she is something of an enigma. While many Western viewers regard her as very beautiful, I find it interesting that none of my Chinese friends and acquaintances have ever identified her as alluring or good-looking. She is, at best, "OK" to them, but not particularly special. Of course what is beautiful is a matter of individual tastes, but the contrast along ethnocultural lines is striking. It seems that her appearance and manner resonate with some groups and not at all with others. First of all we might observe that she is not at all delicate like a flower, and she is not pretty like a picture. Instead, her face and demeanor suggest action, along with latent passions. And that, I suppose is the secret behind the magnetism that she brings to the screen for some people. It is this smoldering passion, seemingly ready to erupt at any time (though it never really does), that energizes Zhang Yimou’s visual spectacles. Her talent, then, is not simply a matter of playing a role and making it believable. In fact, when I revisit her films, I am not even confidant that her general acting is particularly skilled or convincing. Her displays of petulance in Raise the Red Lantern seem forced and artificial, and her reactions to Zhuoyun and Yan’er do not seem as spontaneous as they should be. When I compare her with Zhang Yimou’s more recent leading lady, Zhang Ziyi, it is the latter actress who may have more subtlety of expression and feeling. 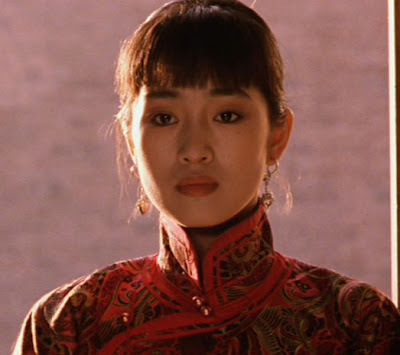 But somehow the hypnotic charm of Gong Li’s emotive glances overcomes any other limitations and permeates the scene. In th is sense she reminds me of Claudia Cardinale. Her face and gestures are enough on their own to connote some mysterious longings for something unspoken, an emotion that frequently lies below the surface in Zhang Yimou’s films. 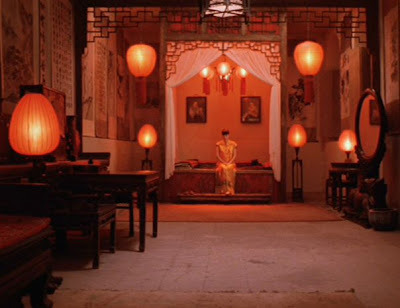 In Raise the Red Lantern that very expressive yearning for something more in life, something beyond the present circumstances, is what dominates the visual expression. The plot is not exceptional, and even the acting is somewhat uneven. But the entire cinematic experience is a visceral representation and demonstration of the metaphor of the "fly in the fly bottle". And the final images of the film display that fly trapped inside a red lantern. 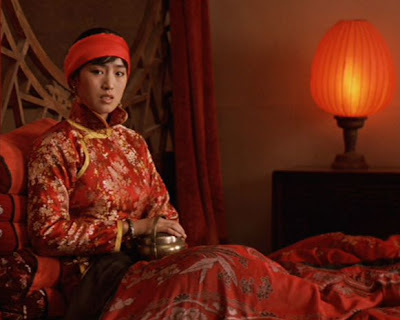 For whatever weaknesses it may have, Raise the Red Lantern, graced by Gong Li’s vivacious presence, is everlastingly memorable for making us linger on and wonder at that metaphorical image.